When a traditional on-demand scan completes and indicates that a system is clear of viruses, is it actually clear, or is it harboring stealth malware? Using traditional technology, it is not possible to have confidence in the accuracy of results. McAfee Deep Defender improves confidence in scan results, by preventing the kernel mode rootkit component of a piece of malware from hiding itself from the operating system. This in turn greatly eases the malware removal process. 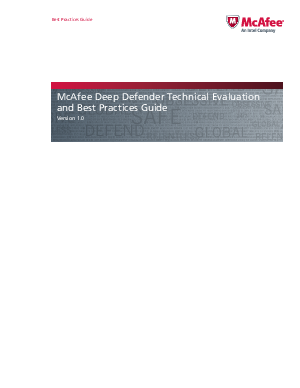 McAfee Deep Defender offers the added value of real-time kernel memory monitoring to detect and block malicious events as they happen (rather than at some undetermined time after the fact)—along with proactive coverage through behavioral profiling.